Back in the day, a bottle of Perrier was considered très chic, being that it was sparkling and born in France. Later bottled water in general became more and more popular and a parade of exotic waters were marketed to us—Evian also reigning from France, Fiji water in that rectangular bottle, San Pellegrino Italian sparkling water (my fave), Voss in a rounded tall glass bottle that could sub as a vase and costs about $5, and a multitude of flavored waters, vitamin waters, electrolyte waters and a slew of high tech waters. I agree, we can’t all simply go to our kitchen sink and draw clean, chemical-free water from the tap these days. I sure don’t want to drink chlorinated, fluoridated and who-knows-what-idated water. Here in New Mexico our flavor happens to be arsenic. Not too appetizing. But if you want gourmet water, you’re going to pay a price and marked up individual bottles of special water is not something I’m willing to spend my money on except for an occasional treat. As it is, we purchase very large containers of spring water for home drinking and cooking. Hotels and restaurants mostly use tap water for cooking and serving. I still ask for a bunch of lemon or lime wedges to put into restaurant water to cover up the bad taste of the H2O. Over the last few years I began noticing the growing popularity of “infused” water. You’ve probably seen these. Water with cucumbers in it, citrus fruits or even berries. They are delightfully refreshing with their splash of color (pun intended) and ever so subtle flavors. My hairdresser recently offered me a glass of water that looked the color of very light grape juice. It was really pretty and it was made by adding ice and frozen berries to the pitcher of water. So simple. That got me thinking about what else would be pretty in water and whether there were other vegetables besides cucumbers that would look and taste good in water. I came up with one new thought. The new idea was beets! If you’ve seen my posts about trying my best to like these little red veggies you may now be laughing hysterically. For those not familiar with these posts, I do not like beets. Love the color of beets, not so much loving the taste of them. How might I make an infused water with beets? I decided to use both red and golden beets and to include fresh mint leaves. I used about half the golden beet and half the red beet sliced very thin and put them in my pitcher with about a quart and a half of spring water and some big ice cubes—also made with spring water. The result was the beautiful color I was expecting, a very subtle and not overwhelming hint of beets along with a touch of mint. I liked it and called it a success. If you are a true beet fan, then you may want to add more beets than I did. This has got me thinking about other aromatic vegetables to infuse water with. Arugula with a hint of rosemary perhaps? What are your favorite infused waters? This entry was posted in Beverages, Cooking, Recipes and tagged beets, Bottled water, gourmet water, infused water, using vegetables to infuse water by mycookinglifebypatty. Bookmark the permalink. Lemon in the water is good. I can’t stand cucumber water. So gross. Tastes like the water has gone bad. Beets I could see being good. How can anyone not like beets!?!?!?! I agree Danny about lemons. They’re definitely an old standby. 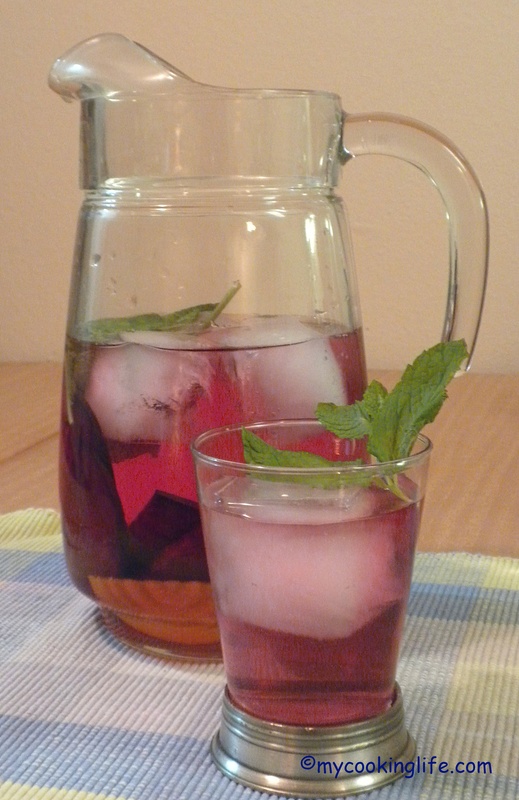 Try the beet infused water with mint. I liked it! And I lived to tell about it! I am a beet lover…and have never seen as many recipes using beets than on your blog. Doing well for a beet-hater 😉 WAter infused with bettroot looks very pretty! That’s really funny isn’t it? And thanks! I’m not 100% anti-beets anymore. It does look pretty and thanks for commenting! I love the idea of infused water. The beets do make a pretty color! I partial to cucumbers in my water – cucumbers and orange slices to be exact. Those make a great combination!